Make a donation to Lumpia With A Vengeance today. Film Independent’s Fiscal Sponsorship program opens the door to nonprofit funding for independent filmmakers and media artists. Donate today and help bring Lumpia With a Vengeance to life. The LUMPIA-armed avenger reappears in Fogtown and teams up with high school student Rachel to prevent a crime syndicate from selling drugs masked as food in this action comedy. Make a donation to Lumpia With a Vengeance. Patricio Ginelsa is a Film Independent Fellow (Project Involve 1999) originally from Daly City, CA, where his passion for filmmaking developed while making neighborhood movies at the age of 13. After receiving his BA in cinema production at USC, Patricio became the Associate Producer of the award-winning film The Debut (2000) and assisted in its two-year long theatrical self-distribution tour, leading to a home video deal with Columbia Tri-Star. Patricio completed Lumpia in 2003 which Variety raved as a movie that takes “low budget to new heights…and should be shown in high-school media classes across the continent.” He’s directed over a decade’s worth of music videos, three of them for the Grammy-Award winning Black Eyed Peas: The Apl Song and two versions of Bebot, one of which was lauded with the California Preservation Foundation Presidents Award for its focus on Stockton’s Little Manila District. A.J. Calomay, a UCLA graduate with a Psychobiology and Cognitive Science degree, found passion in film and media while producing videos for UCLA’s Filipino organization. In 2001, the West L.A. native established Xylophone Films, and along with Kid Heroes Productions, produced a decade’s worth of high profile independent projects, including music videos for the Black Eyed Peas, the Apl Song, Bebot, Bambu Old Man Raps, The Debut featurettes and the feature film Lumpia. Calomay has also directed full-length documentaries for hip hop artists Dudley Perkins and Wildchild from Stones Throw Records. 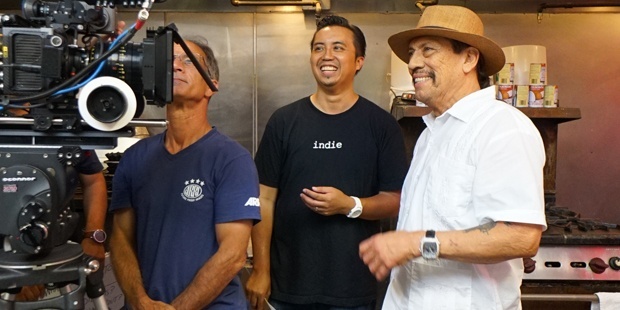 In addition to running Xylophone Films, Calomay runs a Filipino food pop-up called You Eat Now! and works as an editor/assistant editor in the post-production industry. He has worked with MTV News, Disney Interactive Media Group, XBox Video, M3 Creative (Iron Man 2 featurette), Fandango.com, NBC Universal/USA Network (Covert Affairs, Mr Robot), and Warner Bros (Speed Racer, DC’s Legends of Tomorrow). Jeff has appeared in numerous features and TV series, including Peep World starring Octavia Spencer, New Girl with Zooey Deschanel, and The Comeback with Lisa Kudrow. Jeff has produced numerous feature films including Note to Self and Black Coffee. In addition to completing a new horror film Home, Jeff is currently producing the upcoming horror film based on the Mexican story of the La Llorona starring Danny Trejo. A Sony Pictures executive for 22 years, Rey Cuerdo began producing feature films as a hobby in 2002. He produced the drama Small Voices, which won Best Film in all of The Philippines’ film industry awards, was the country’s official entry to the Oscar and Golden Globe awards and became the first Filipino film to be distributed by a major Hollywood studio (Warner Bros). In 2008, Rey executive produced Dim Sum Funeral, an HBO Films comedy. He was an executive producer of the Filipino horror-comedy hit Remington and the Curse of the Zombadings in 2011, and secured U.S. and international distribution for it, as well as an English-language remake in development. In 2015, Rey produced Toto, a festival award-winning Filipino American comedy. He helped produce the documentaries Motherland (premiered at the 2017 Sundance Film Festival) and Ulam (premiered at the 2018 San Francisco International Film Festival).